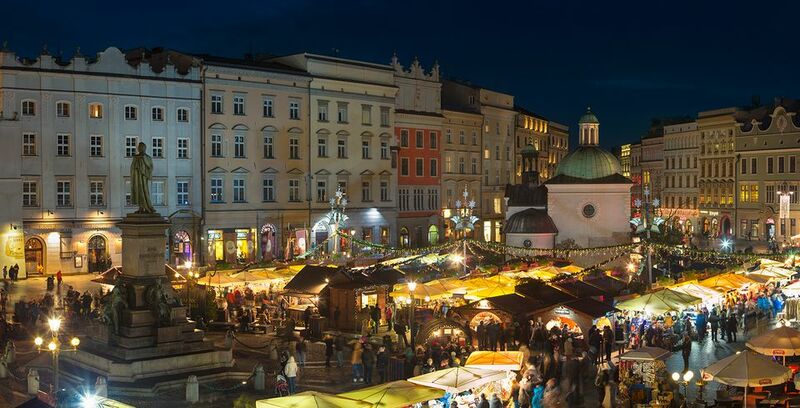 The largest Christmas market in Poland takes place in Krakow's Main Market Square during December. Other Polish (and European) cities host Christmas markets, too, though depending on the size of the city and its resources, they may not be as expansive as the market in Krakow. If you're shopping for handmade crafts or Polish Christmas decorations, or if you want to sample cold-weather Polish treats, even small Christmas markets will give you an idea of how Poland celebrates this holiday. Historic centers dripping in Christmas lights and squares decorated with trees make Poland's cities and towns even lovelier. Dates change for Christmas markets from year to year depending on popularity, size, organization, and other factors. However, most Christmas markets run through December and close up shop right before Christmas to give both vendors and shoppers a break for the holidays. But until then, if you're visiting Poland in December, be sure to spend some time exploring the Christmas markets. Krakow's Christmas market is a huge annual success. The largest in Poland, it attracts visitors from around the world. Main Market Square, always lively, becomes festive with carriage rides, Christmas decorations, and the smell of mulled wine. Christmas in Krakow is not to be missed. The Krakow Christmas Market usually opens up towards the end of November and lasts until December 26, although it is often extended to early January because Three Kings Day marks the end of the Christmas season in Poland. Warsaw's main Christmas market is held in Castle Square in front of the Royal Castle. Another Christmas market can be found in front of the Palace of Culture and Science. These two markets make December a worthwhile month for visiting the Polish capital city. Wroclaw's Christmas market is held in Wroclaw's Old Town among its historic sights. This market dates back to the 16th century. Children will love the market's fairy-tale forest, where they can watch fairy tales being acted out. The increasing popularity of holiday markets in Poland means that the Wroclaw Christmas market sees more visitors each year, which in turn, encourages more vendors to work stalls selling crafts, decorations, and tasty treats that help stave off the chill. Torun is not as large as other cities in Poland, and the size of its Christmas market reflects that. However, with its medieval charm, Torun looks beautiful when decorated for Christmas. So if you're in the area, there's no reason not to check out the small Christmas market here. Grab a mug of hot mulled wine or find an ornament for your tree at home or to give as a holiday gift. The city is also known for Gingerbread. They have been making it since the 14th century in traditional molds. If you're in the port city of Gdansk during in December, be sure to stop by its Christmas market on Targ Weglowy to meet the Polish Santa, take a twirl on the ice skating rink, and see Christmas tree displays from around the world. Buy gifts made from amber harvested from the nearby Baltic Sea or find souvenirs that will remind you of your stay in this northern city. Poznan's main square is a lovely venue for a Christmas market. This market stands out with a nativity scene and the International Ice Sculpture Competition, the products of which are left standing until they melt.